Scuba diving in Palawan is truly remarkable with its diverse marine life and underwater landscape unlike any other. What better way to truly experience the beauty of Palawan’s wonders than to take a journey underwater? This tour is not for everyone. This is for those who live for adventure. Those who can breathe underwater in exchange for the otherworldly landscape hidden away from all of us. Our years of experience scuba diving in Palawan, both recreationally and professionally, makes us qualified to choose the best diving destinations for your group. We are here to give you an unforgettable scuba diving adventure during your well-deserved holiday. One thing is for sure, you’ll get to scuba dive in one of the best dive sites in the world. Note: This is just a sample itinerary and can be tweaked to suit your interest. Let us know if you would like to add other activities. Please see ‘Activities’ below. We will welcome you at the airport and transfer you to your hotel. 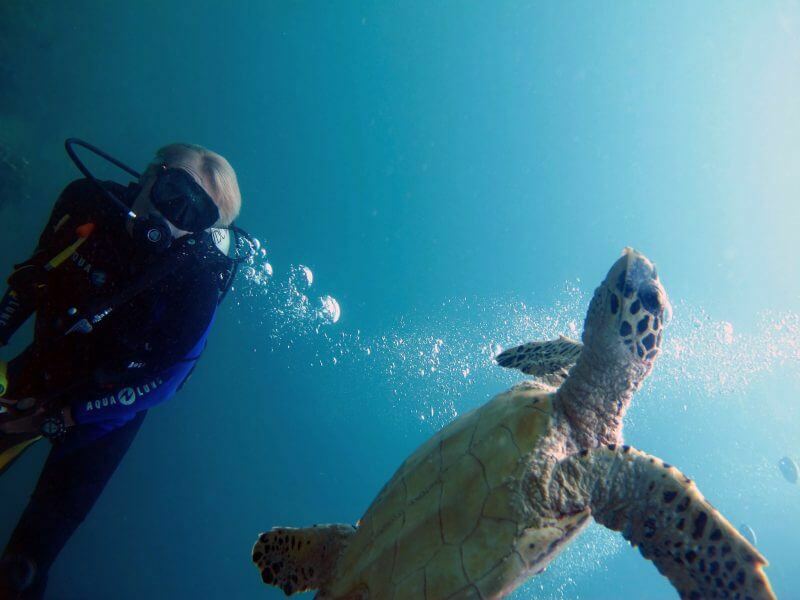 Along the way, our representative will brief you about your upcoming dive tours in the itinerary. Optional: We will pick you up before sunset for the “Food Crawl.” We will visit the top 5 restaurants in El Nido town and taste various Filipino food, usually popular snacks, and appetizers. Our representative will fill you in with stories and insights about the local food. Our representative will accompany you to the dive shop for the fitting of dive equipment and to fill out any required paperwork for the next day’s dive tour. Please ask the itinerary specialist if booking for 2 or 4 dives in a day and if there would be non-divers to join the boat tour. Our representative will pick you up at your hotel at 7:45 am to take you to the main pier. The speedboat or Banca/motorized boat, depending on the preferred mode of sea transfer, will take you on a journey to the first dive site. Non-divers can relax or snorkel around the dive stops. There will be 2 or 4 dives in different sites which may vary according to weather and sea conditions. Optional: Professional photographers to take proper videos and pictures of your dives. At the end of the dive tour, our representative will transfer you back to your hotel. Our PADI professionals will take you to different dive sites and possibly some special dive sites in El Nido. If you prefer sharks, school of fish or walls, our dive instructors or experienced PADI guides will try their best to take you to the best sites with big marine life sightings, depending on your dive site preferences. Please note that dive sites may vary according to weather and sea conditions. Enjoy your last day of scuba diving in El Nido. Free time suggestion: Lio beach (on your own). Our representative will pick you up at your hotel at 5:30 am for your journey to Coron. You will depart the pier at 6:00 am and arrive in Coron between 9:30 and 10:00 am. Departure and arrival times may vary up to 1 hour due to sea conditions. The ferry schedule is subject to change. Please ask the itinerary specialist if booking for 2 or 3 dives in a day and if there would be non-divers to join the boat tour. Our representative will pick you up at your hotel at 7:45 am to take you to the main pier. The boat will take you on a journey to the first dive site. Non-divers can relax or snorkel around the dive stops. There will be 2 or 3 dives in different sites which may vary according to weather and sea conditions. Our PADI professionals will take you to different dive sites in Coron, from WW II shipwrecks to coral sanctuaries. Please take note that dive sites may vary according to weather and sea conditions. Enjoy your last day of scuba diving in Coron. Free time suggestion: Explore the busy town and market.